The KONAVI® Feeder gives birds easy access to feed without stepping in it. MILFORD, Indiana, U.S.A. — The KONAVI® Feeding System features an open-style pan design that is lower to the floor and provides easier access for birds to eat from day one. In spite of the low pan height, the feeder’s patented design deters birds from getting inside the pan and soiling the feed. According to Dave Laurenz, Director of Marketing for Chore-Time, this is a breakthrough in open-style feeding that will give poultry growers a valuable new tool to keep feed clean and encourage healthy eating. With its ultra-low pan height and patented scalloped edge, the Chore-Time KONAVI Feeder lets chicks eat from the outside of the pan. Broiler producers can flood pans high to attract day-old chicks, and then use one of three grow-out settings for finishing birds. The KONAVI Pan features a unique angled cone with anti-rake fins that discourages birds from stepping into the feeder and scratching feed out of the pan with their feet or beaks. 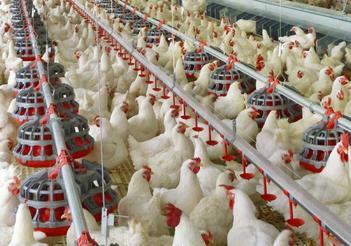 It helps keep feed clean and uncontaminated – improving feed availability and feed efficiency. With the KONAVI Feeder, there are no grills, corners or pockets to trap feed. The simple, streamlined design permits more complete cleaning of the feeder between flocks for better bird health. 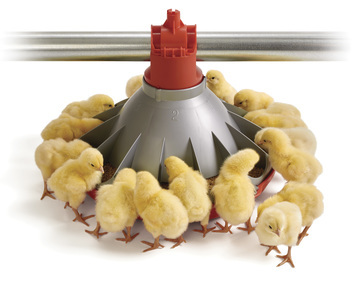 The KONAVI Feeder was designed for global poultry production, but its simple design also works well in a wide variety of traditional broiler production environments.